Chips + Spencer *26.03.2015 - arbeitsaussies Jimdo-Page! Um Bilder der Welpen zu sehen, bitte auf das Foto oben klicken. Click on the photo above to see the puppies of Chips and Spencer. Chips ist Französischer Vize-Champion aller Hunderassen im Hüten. Sie ist eine nette, ruhige aber willensstarke, kleine Hündin mit einem starken Arbeitswillen. - And finally again by qualifying for the Championship of France on herds sheep breeds Inter-2014. stockdog in France at the age of only 6 years. 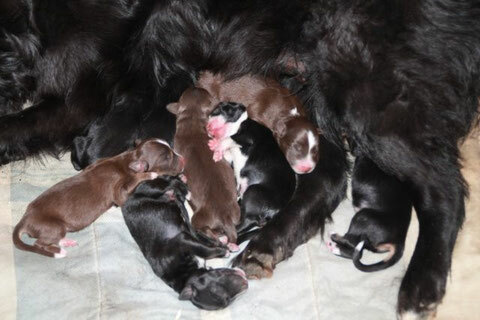 Moreover, in her puppies, we can already see with gold and obtaining patents in many disciplines such as tracking, obedience, agility, the herding and even rescue. What is quite remarkable. cattle suckler cows with calves and various poultry. She has a remarkable complicity with his master and shows him a confidence almost limitless.